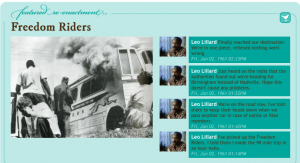 What Would the Freedom Riders Have Tweeted? "It was like watching a movie, but it was going on for a month," says Jennifer Klein, World Civilizations teacher at the Open High School of Utah, an online charter school. Welcome to the latest iteration of Twitter in education. Using TwHistory, a group of 12 of Klein's students researched historical documents, took on a historical character, and Tweeted their actions to create a month-long reenactment of the 1961 Freedom Rides this May. TwHistory co-founder Marion Jensen told her school about the project when it was in its earliest stages, Klein says. And since the Utah Education Network, which had given a grant to TwHistory, was pushing for coverage of the Freedom Riders in celebration of the movement's 50th anniversary and a new PBS documentary, Klein and her students opted to have a Freedom Ride going at the same time that the Freedom Rides took place. They started on May 4th and went continually until June 2nd. "They understood that this was a real event. They were intrigued and excited to learn more." Her students used Google docs to create the Tweets about their character – the group ended up with 10 total – and then merged them in a single document at the end of a month of research. Since it was an early TwHistory experiment, the twelve students involved had to apply to be a part of the project and take care of all of their work as an extracurricular activity. But that was hardly a deterrent. "They researched so much!" says Klein. "And I wasn't able to hand-feed them; they had to do the research for themselves. Some went to the Salt Lake City library to look at microfilm from the time period. It was phenomenal because it forced them to really dive into primary source documents." Plus, this kind of in-depth, personal research brought history to life for students. If they were to Tweet from a character's perspective, they had to really understand and embody that character. One student represented "the only white woman on the first bus ride. And she wrote 300 Tweets – she couldn't stop, she had to tell this person's story." And one student "called me in tears," Klein says, "asking, 'Did you know that they beat up these people?' Lots of students said, 'It seems like a whole new world! It doesn't seem like it would happen in America.' But they saw the dates, they saw where this was happening. They understood that this was a real event. They were intrigued and excited to learn more." There were "a lot of intense things going on" during that period which made for a dramatic reenactment. For instance, a bunch of Tweets would come in at once, saying, "Uh-oh, there's a mob coming," but after that "no Tweets would come in because they were getting beaten. It was so heartfelt. This in-depth personal experience really made it come alive." Once they'd finished their research and used TwHistory to set the reenactment rolling in real time, "other students and teachers started to follow it in our school," says Klein. "They were also blown away." Overall, it was an incredible project and Klein found great success with it, though she did learn a few lessons along the way. One thing she'd recommend to teachers and students interested in creating their own reenactments: Don't make it a month long. After a good three weeks of continually Tweeting, "It was hard to keep them going," she says. "They were so excited during those first two weeks – I saw so many Tweets! The third week was okay, but by the fourth, I had to be like, 'Come on guys, just a few more!'" Likewise, the students and teachers at her school who were following the reenactment started to lose a little interest by that time, too. Still, even without using the TwHistory platform, asking students to develop Tweets about historical events as a single assignment got them interested. After the Freedom Riders project, she asked nearly 100 of her regular students to create 30 Tweets from Christopher Columbus' perspective, using his journals that are simple to find online, and that was a great success, too. "It all comes down to what you can get the most primary source documents from," says Klein, "but someday I would love to do a big one, like the Continental Congress as they're writing the Constitution. I think that would be really fun to do. Or World War II, with each student Tweeting from the perspective of a different country... well, the time zones could get a little crazy for that one." Read more about Twhistory here.